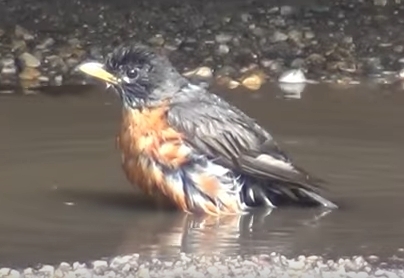 Worms only make up about 15%-20% of the summer diet for American Robins. The rest of the diet is made up of other insects, fruit, nuts, and berries. Contrary to popular belief, American Robins don’t find earthworms by hearing or smelling them. Robins find earthworms by cocking their head to one side, independently using each eye to look for visible signs of worms. Most of the earthworms found in North America today did not exist prior to European settlement. They were imported mainly from Europe by early settlers. The worms or worm cocoons traveled in the rootstocks of plants brought by the settlers from their homelands. They were also release into the new world through soil that was used for ship ballast that was discarded after the voyage to the new world. Robins can be attracted to a feeding station by offering mealworms, suet, nuts, fruit and a birdbath. It’s especially fun to offer mealworms during nesting season when the robins can stop and pick up a mouthful of tasty worms to take back to their babies. They will fill their mouth until you think nothing else could possibly fit inside and still continue to try to pick up more, dropping some in the process and then trying to pick up more. On average, over 50% of all nesting attempts by American Robins fail to produce young. Out of the successful nesting attempts, only ¼ of the fledglings will survive until November. Robins live on average about 1 ½ years, but, according to bird banding records; the oldest known Robin found in the wild was almost 14 years old. Robins typically nest from April through July and can have 2-3 broods in a season. The female does the nest building and incubates the eggs alone. Upon hatching, both parents feed the average brood of four young. Robins usually return to the same area to nest each year and may occasionally use last year’s nest again after some renovation. Robins are particularly vulnerable to pesticide poisoning due to their preference for foraging on lawns. Please don’t use poisons on your lawn. 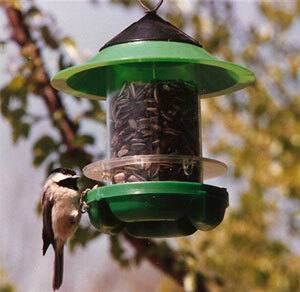 THE CHICKADEE is a specialty feeder for little birds like the chickadees, titmice, nuthatches and goldfinches. These smaller birds don't require a perch and can cling to the side of the feeder to grab a quick bite to eat without the competition from starlings and blackbirds. A blend like the Wild Birds Unlimited No-mess full of sunflower chips for the finches and peanuts for the the chickadees would be a real treat for these friendly birds. It is easy to fill, easy to hang and made in the USA. 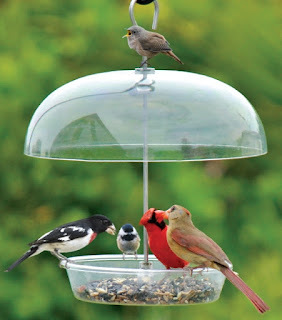 This feeder would be perfect outside a kitchen window where you can enjoy watching their antics up close. When I was cleaning up the garden in front of the Wild Birds Unlimited store, I heard the Ring-billed Gulls announce they were back. They were circling the Meijer Parking lot across the street making excited high-pitched, squeals. Often called "seagulls", the Ring-billed Gulls tend to spend only the winters on coastal beaches in the south and then when spring rolls around they congregate inland around humans, at garbage dumps, parking lots, and freshly plowed fields. Ring-billed Gulls eat mostly fish, insects, earthworms, rodents, grain, as well as French fries and other food discarded by people. Food, few predators, good perching spots on light posts, and heat thermals off the black parking lot that lift the bird so they can soar are some of the reasons they hang out in large parking lots. Spring is a time when a lot of birds fly thousands of miles to return to their Michigan nesting grounds. When they reach your yard they are exhausted and looking for a quick high protein meal to help them recover. 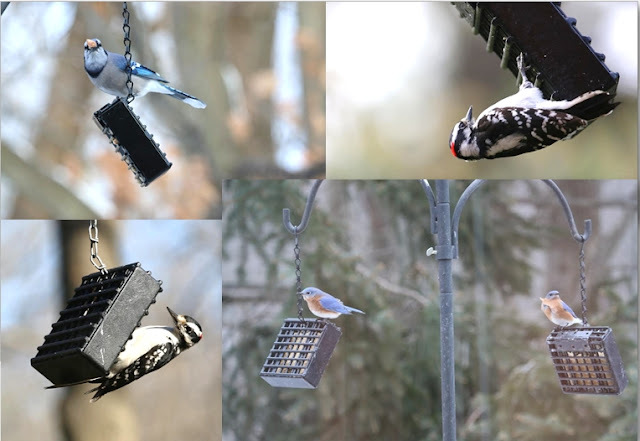 With some cold days still ahead, expect different warblers, grosbeaks, wrens and your regular woodpeckers to stop by to fuel up on your suet feeder. Another good reason to always keep that feeder full! Along with the Red-winged Blackbirds and Common Grackles, people are now reporting the arrival of the Brown-headed Cowbird. Cowbirds are interesting birds. Instead of building a nest and raising their own young, they are a brood parasites and lay their eggs in the nests of several host bird species and allow them to foster their babies. The female Cowbirds wander about, laying up to 40 eggs per season (April to June). Males are the first to arrive. They are a glossy black bird with a brown head and a pointed gray beak. The female soon follows. She is a dull gray/brown bird with lightly colored streaks on their breast, and a pointed gray beak. Photo Share: and in NJ?! This one is new to me. At first quick look, I thought I had a sick bird with yellow stuff on its tail. I am pretty sure I have never seen these in NJ. They LOVE berries, and apparently the same ones they like out your way. Thanks for your post! 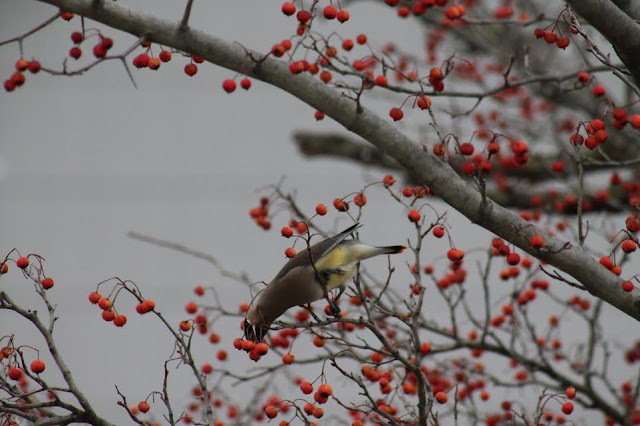 Cedar Waxwings are one of my favorite birds! Mostly frugivorous or fruit eater, they will perch on a branch and pluck berries or hover in the air and grab berries. If the berries have fermented, the birds can actually get drunk. But their digestive systems are quick and the seeds of berries are eliminated within 45 minutes. 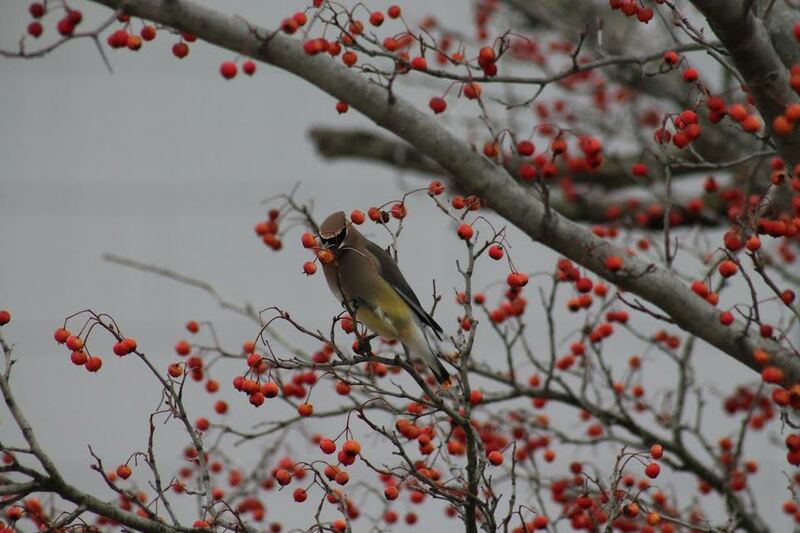 You might hear the waxwings before you see them. They have a very distinctive thin, high-pitched warbled "zeee" or "zeeet" call that is hard to forget. They travel in flocks of 40 or more birds and often will appear in a spot with a good crop of berries. When they have eaten all the berries, they move on. Thank you for sharing your photos! If anyone else would like to share a photograph of nature send it to bloubird@gmail.com and I'll put it on the Friday Photo posts. Most specialty bird stores like Wild Birds Unlimited have Upside down Suet feeders but you can also convert your own suet feeder. 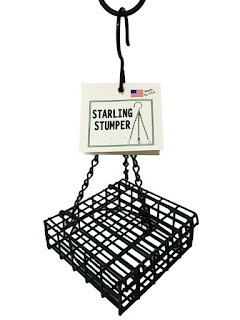 We have a hook with three chains that attach to an existing suet feeder called the Starling Stumper that makes it easy. This allows you to hang your basic suet cage sideways. But if you can’t find the Starling Stumper chain you can use hooks or chains to hang your suet cage so that the weight of the feeder is balanced and the feeder hangs level horizontally. 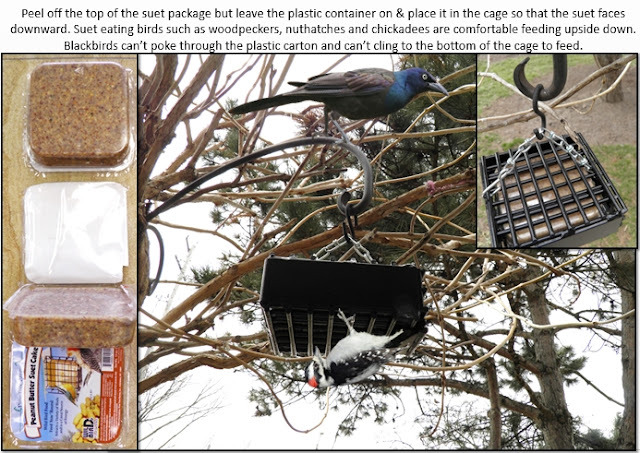 Peel off the top of the suet package but leave the plastic container on and place it in the cage so that the opening faces downward. Suet eating birds such as woodpeckers, nuthatches and chickadees are comfortable clinging underneath to feed upside down. Blackbirds can’t poke through the plastic carton on top and can’t cling to the bottom of the cage to feed. This is a quick fix to keep the voracious blackbirds from eating all your suet. Photo Share: Beauty and The BEAST! The Beast is a new indestructible suet feeder! Dan Panetti, the owner of the Mequon, Wisconsin Wild Birds Unlimited store introduced us to The Beast a few months ago. He sent me some OUTSTANDING photographs of all The Beauties he's attracted to The Beast suet feeder. Why is it called The Beast? Once you pick it up, it's self explanatory. There is no critter in the backyard that can destroy it. Dan even took this picture: "Here's a photo you can use in your store which serves as a testimonial to it's strength and durability. 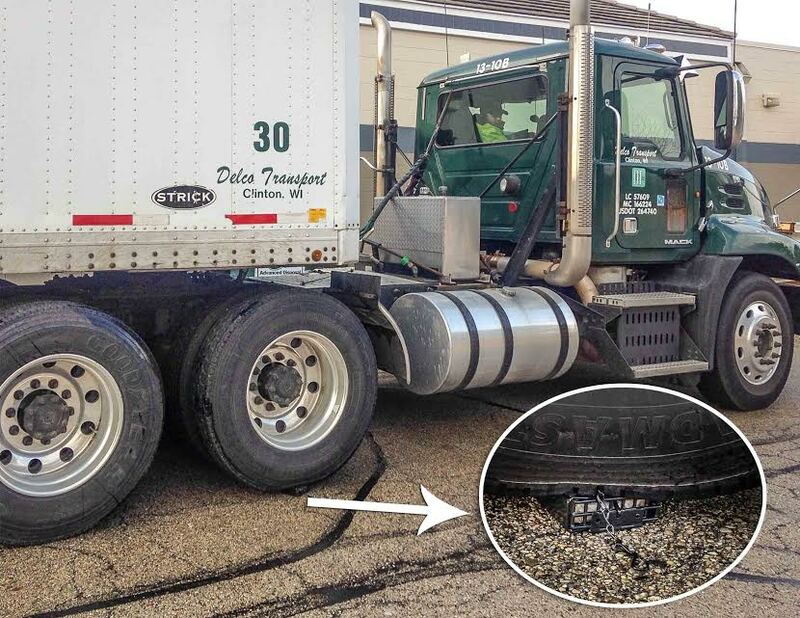 (You really need the right Knucklehead truck driver to pull this off)"
They are so popular it's hard to keep them on the shelf. 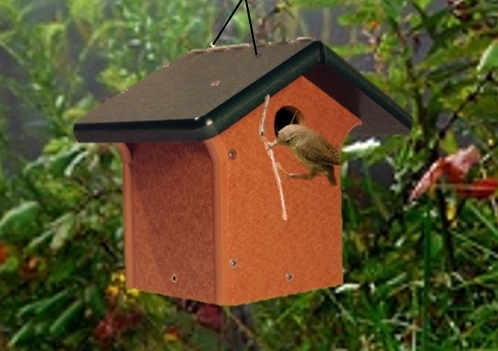 Our high quality EcoTough™ Wren or Chickadee bird house allows for proper drainage and ventilation to keep the nest and babies dry and has an ideal floor size and entrance hole for wrens and chickadees. It also includes our two-way opening system. The side opens for clean-out, and the roof opens for peeking into the nest. EcoTough feeders and houses are environmentally friendly, high quality products that are made from recycled plastic milk jugs. 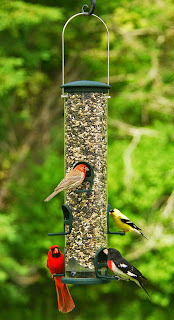 These feeders are made in Wisconsin, USA. EcoTough feeders and houses won't rot, crack, fade or warp like wood can. They also come with limited lifetime guarantees. Complement your bird house with a complete bird habitat! You can feed birds year-round. I love my winter birds. The puffed up chickadee, the brilliant red cardinal and the drab but sunny songed goldfinches entertain me during the long cold months. 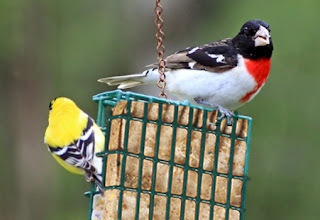 But I can’t wait to put out extra plates for the spring and summer birds; Rose-breasted Grosbeaks, Indigo Buntings, wrens, hummingbirds, orioles, Song and Chipping Sparrows to name just a few. My reward is the extra bright songs and colors right outside my window. Birds don't take a Spring Break. 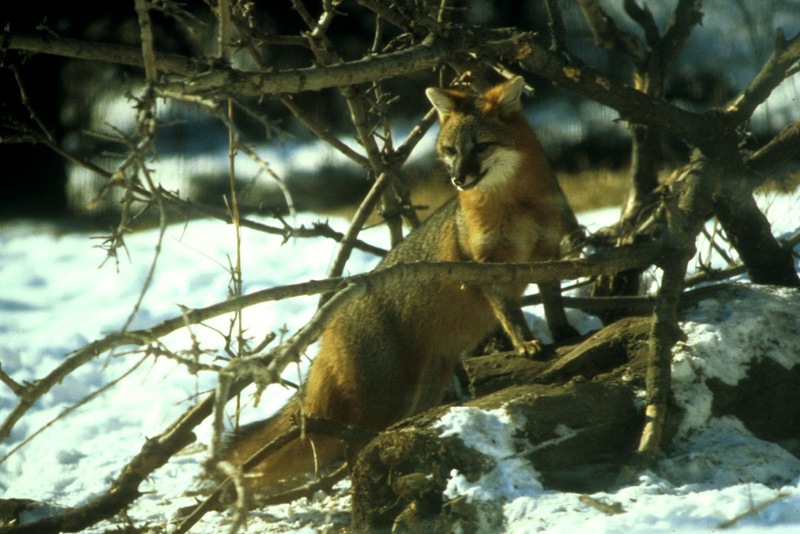 It is the hardest time for them to find food as many prime food sources are depleted. 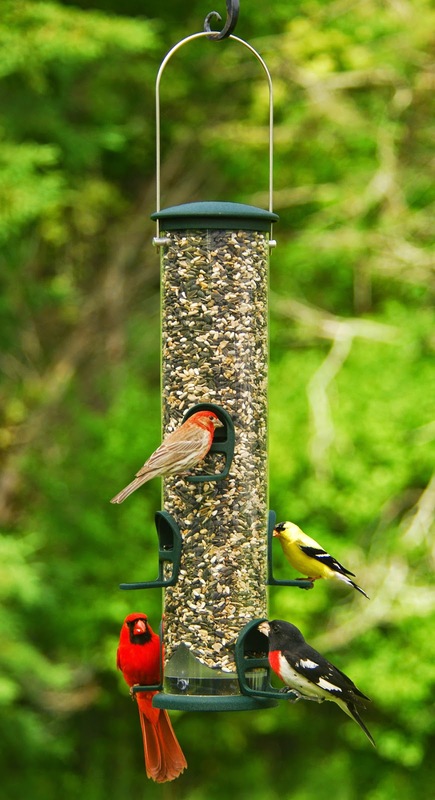 Bird feeders provide an easy source for birds after a long winter or arduous migration. 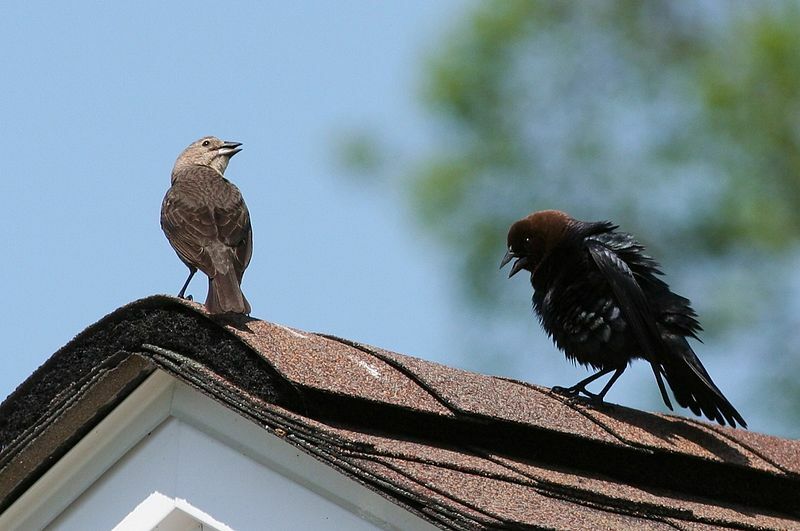 Many birds migrating to their nesting grounds may see yards with lots of bird activity as a safe stop-over point. The numbers and variety of birds appearing in your yard can actually change every morning all the way to the end of May as species such as warblers, vireos, tanagers, gnatcatchers, kinglets and sparrows all migrate north. There are varied signs of spring: migrating birds passing through, new songs in the air, and the earth slowly waking up from its long winter nap. And there is another sign that is just as predictable which you may have noticed, the bird battles. This morning a few sparrows were streaking across the sky in a chattering air battle. The testosterone levels in male birds is up in the spring, territories are being determined, and battles break out. House sparrows chasing each other or in a seemingly endless wrestling match is not uncommon. It’s usually a bloodless battle that ends when they are distracted or one bird taps out. Cardinals and Robins are also choosing their nesting territory. Their winged battles are usually short lived with a clear winner decided. The exception is when they spot a competitor that is about the same size and coloring. 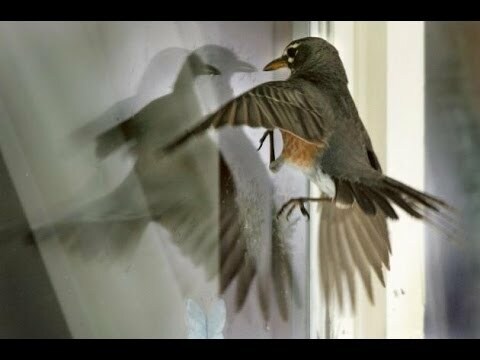 I’m already getting calls about cardinals and robins attacking their reflection in the window. This is also a territorial behavior. 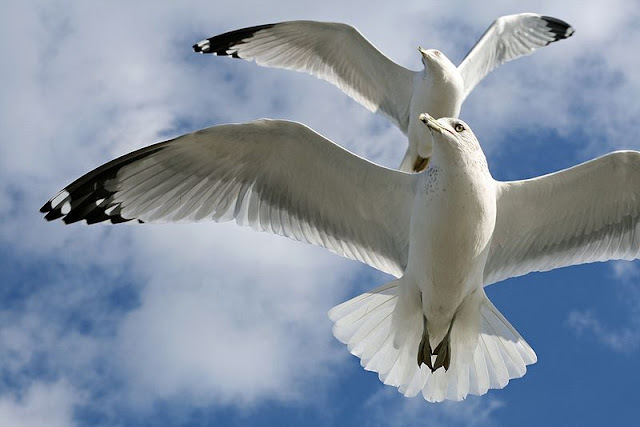 They are usually unattached birds without a mate to direct them in a productive direction. Most birds do stop after a couple weeks of window pounding in the spring, but it's better to try and deter the birds just in case it turns out to be an action that is performed so often that it becomes almost an involuntary response. • Shut the blinds on your windows when you are not at home and at night. • Rub the window with a bar of soap or squirt with liquid soap to decrease the reflection. • Hang balloons or Flutter Scare tape. * Anything that moves and repels the bird from that area will be effective. • Post a spider web window cling outside a window. * The image of a sticky web will keep birds from flying towards your window. • Install a window feeder. * This breaks the reflection and other birds interrupt the birds battles with himself. Spring is here officially! With spring’s arrival, the pace of migrants returning increases with swallows, killdeer, blackbirds, and sparrows. 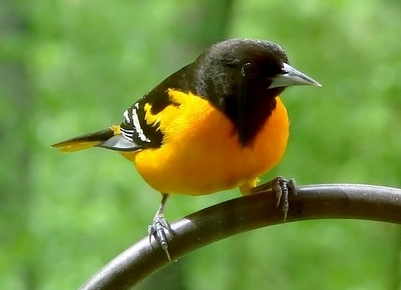 Long distance travelers like the orioles and hummingbirds are on the move but still way down south. I also put up my hummingbird feeder mid-April. 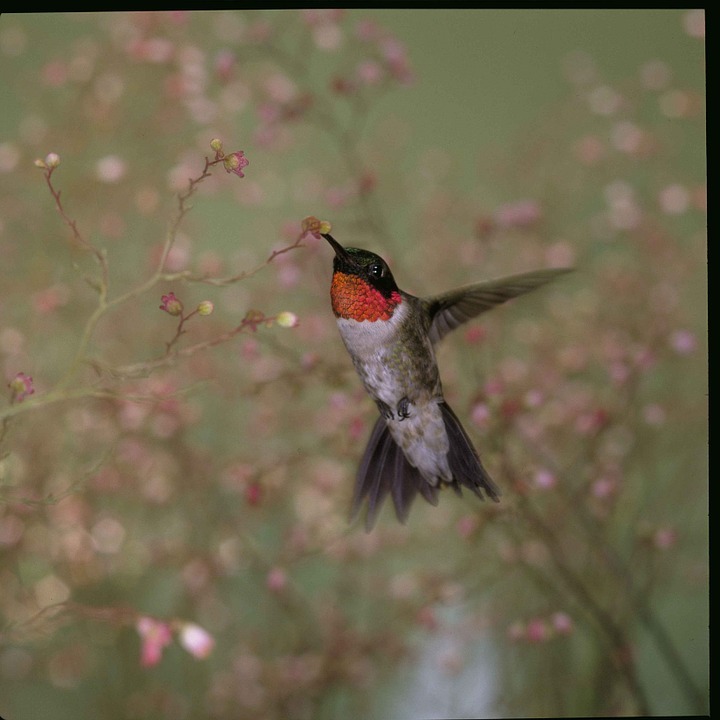 You can track the migration of the Ruby-throated hummingbird on www.hummingbirds.net. The hummingbirds we see in April probably won’t stick around but continue on to nest in the Upper Peninsula or Canada. The hummingbirds that choose to nest in our area (the regulars) usually arrive by Mothers Day, the second Sunday in May.